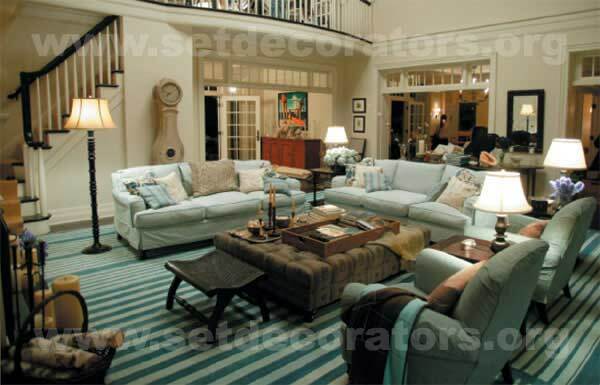 The house as a character, defined by Writer-Director Nancy Meyers and brought to life by Set Decorator Beth Rubino SDSA and Production Designer Jon Hutman, was the central element of visual definition in the film SOMETHING'S GOTTA GIVE. The viewer begins to know Erica Barry (Diane Keaton) long before she comes onscreen, because of the imprint of her home. 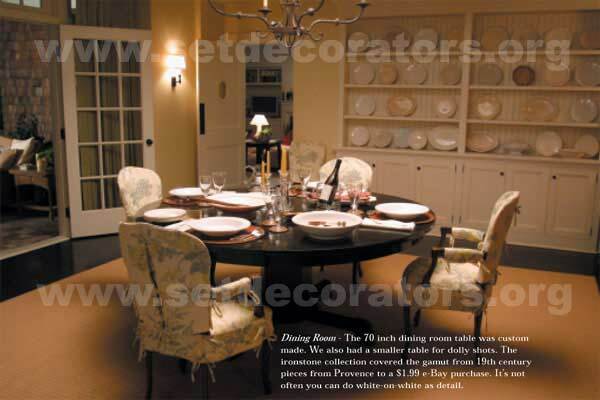 The house sets were, quite fittingly, featured in the November issue of ARCHITECTURAL DIGEST. 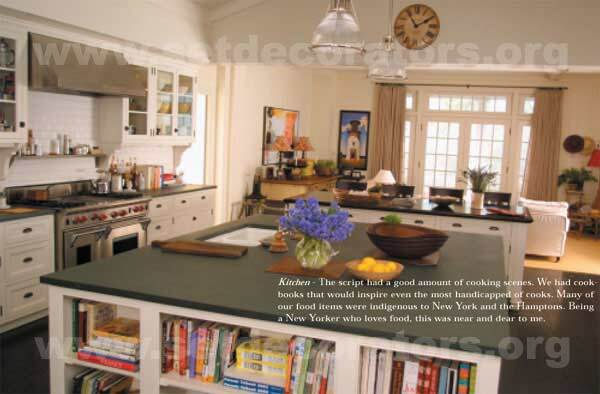 "The real challenge was to deliver the 'character' of the house - a great Hamptons house, beautiful, but not overly designed Ð and express Erica's character, her history and passions, shared Rubino. That fine line is all in the detail." do that. I often use music to enhance the mood. 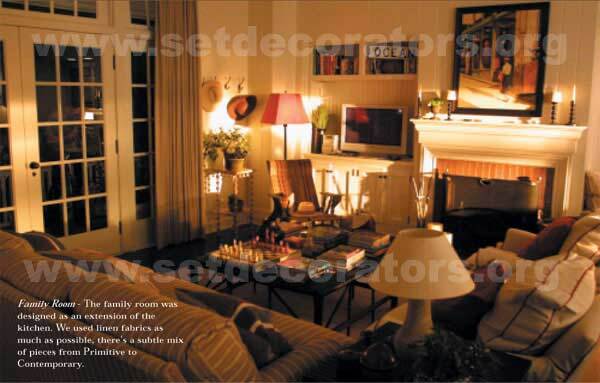 The idea is to create an entire environment - the set decorator's job goes far beyond choosing furniture. "The window treatments were simple and elegant, and all about the flow of air - of the story, of the rooms," she described. "Most were linen, with box hem-stitching to allow movement of air. 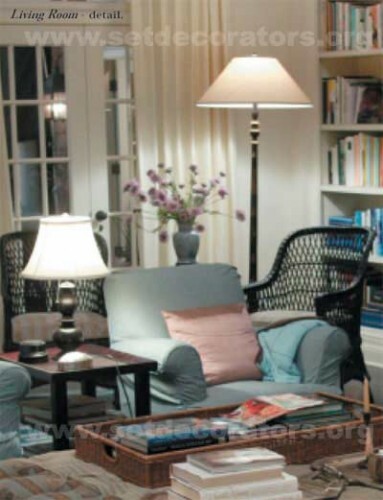 We also used different densities of sheers to slightly obstruct or diffuse the light, but not impede the flow of air." "Rooms were lit by the practicals, which makes for more intimate lighting," she continued. "The lighting decisions play a very important role. You have to predicate your choice for each light [lamp, overhead, sconce, candle] by its function in the room and its function aesthetically." "All of this hinged on the gorgeous and pragmatic designs by PD John Hutman," revealed Rubino. "John wanted to define a difference between the beauty, air, light and privilege of the Hamptons; and the gritty heaviness of densely populated New York." The use of windows, looking within and without, seeing through one space and into another, provided multiple perspectives and more intimate connections. The two bedrooms of the lead characters, played by Keaton and Jack Nicholson, were on opposite sides of the pool. [All built onstage.] "It was beautifully designed with visibility from one room, across the pool, and through to the other room," Rubino said. "To maximize the look, we lit most of the exteriors by candlelight, and had large lanterns and candles made, to surround the house. The candles and the reflective light of the pool had a wonderful effect." Attention to detail and a penchant for research seem inherent in the make-up of a set decorator. "It's a misconception that when doing a contemporary piece, little research is involved," stated Rubino. "Even with the bonus of being a New Yorker and knowing elements of living in New York, I did an enormous amount of research for this film. You have to look into the nuances of each character's life and the elements that a script specifies or touches upon - each project is its own beast."